Although many are rallying in support of the Tathra community, there is still more that needs to be done. Financial donations are the most effective way to quickly provide the right kind of assistance to people who need it most. These donations support people affected by the fire with food, accommodation, counselling and much more. Qkr App: For those parishes currently using the Qlkr app, please refer to Vinnies Tathra Bushfire Appeal which will be listed under the“Special Appeals” option. The recent fires in beautiful Tathra has caused so much trauma and heartache to many. We offer our prayerful and practical support to all who are suffering. Remarkable courage and faith has been shown by the close Catholic community of Stella Maris, Tathra, during the bushfire tragedy. them with our prayers and practical charity. The Archdiocese has given an immediate donation of $8000 to the Vinnies Appeal. Last year Phil McDonald, a well-known Catholic in the Bega-Tathra area lost his wife suddenly. Then 27 days later his 93 year old mother passed away. A few weeks ago he nearly lost his home in the Tathra Bushfires. The fire came within a metre of the home. Many know him as the former owner and manager of the Bega Village Motor Inn. He retired in 2012. Caleb Shaw, a former Canberran came to live with the McDonald’s two years ago and was home on the day of the fires. “I remember it was a very hot, windy day with the temperature reaching 48 degrees Celsius,” Mr. McDonald said. “I had been out to a Church Family Group luncheon and arrived home at 3pm. “In less than an hour emergency services were advising everyone to evacuate. Mr Shaw said it was a terrifying experience. “By that stage there was thick black smoke everywhere and the vision was at about 200 metres,” he said. “But the fire was close and it was starting to get really hot. Tathra parishioners Colin and Pat McRae, cannot believe they still have their house and they are extremely grateful for the efforts of the firefighters. The couple managed to escape the blaze but they had embers on their veranda and the side of their house is singed. Their shed and backyard however were scorched. “The heat was coming and I could see the fire up the back [towards the scrub on the edge of the town] and a gumtree took off and I was trying to fight the fire at the houses here,” he said. “Embers were flying around on the deck and a fire started at our shed.” Mr McRae had his two vintage cars in the shed, one which had been passed onto him by his grandfather. He said he tried to put out a couple of spot-fires at the house next-door and got one of the cars out to the front. Then in the panic and confusion he lost the keys to his Valiant Charger. “It sat out there (the front of the house) for three days,” he said. “I then thought everything’s gone, I’ve lost the shed.” Mr McRae said he couldn’t sleep because he thought the house would be gone. “The next morning, my son from Canberra saw [the house] on the television and took a photo of [it] still standing,” he said. The McRae’s three children, Murray, Philippa and Erwin all live in Canberra and have been tremendous support for their parents. Family is so important,” Mrs McRae said. 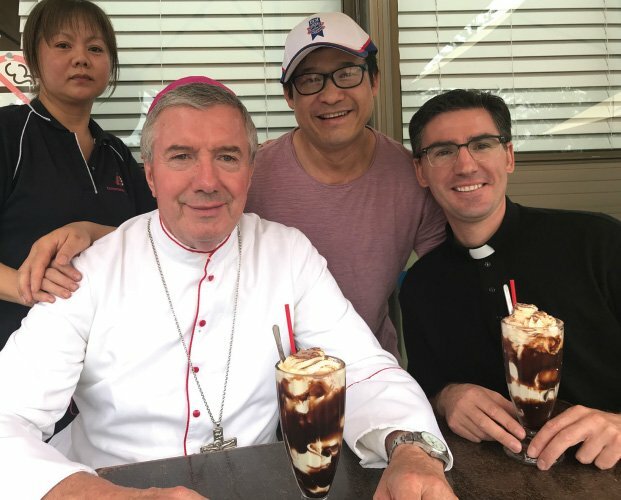 Tathra Catholics, Joe and Quyen Nguyen, generously used their town bakery to host a fundraising initiative on March 24. The event was aimed at providing members of the Tathra community with a relaxed venue to congregate and talk about events of the past few weeks. Residents were offered free coffee, pies, sausage rolls, donuts, hot cross buns, croissants, bread and bread rolls. “It’s a time for people to come together and support one another at this tragic time. Approximately $3,000.00 was raised through donations made by visitors and Tathra residents during the Saturday morning and early afternoon. This money will be further donated to assist community members who have suffered significant loss as a result of the fire. Participants in ‘Breakfast at the Bakery’ consumed 400 pies, 200 sausage rolls, 52 loaves of bread, 450 bread rolls, 350 donuts, 120 bottles of water, 330 hot cross buns, 150 croissants and 326 cups of coffee! Tathra parishioner Marg Taylor said expressions of both heartfelt emotion and sincere appreciation were evident at the bakery. “All agreed this was an amazing example of the good will and support that exists in Tathra,” she said. St Vincent de Paul in the Archdiocese say financial donations are the most effective way to quickly provide the right kind of assistance to people who need it most. “We have received an overwhelming response in food donations which will be sufficient to serve the need of people affected by the Tathra bushfire,” a recent statement said. ‘Vinnies’ Bega, which is supported by other Society centres within the Archdiocese, has also made available a large amount of quality clothing to the Tathra community. “Our thoughts and prayers are with all those who have been deeply affected by the Tathra bushfires,” the statement continued.